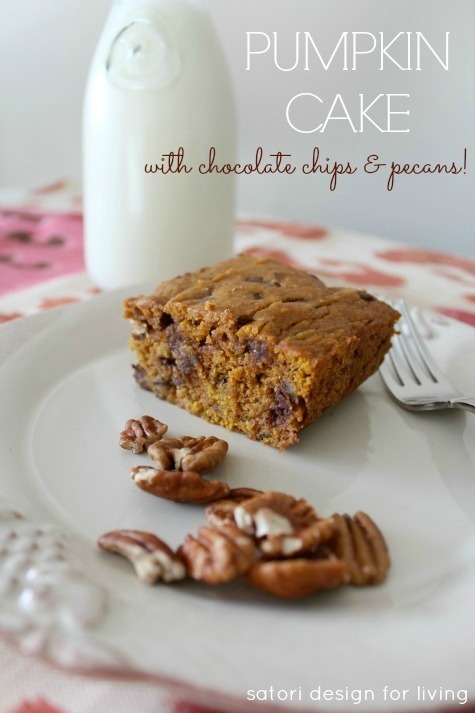 You’ve gotta try this recipe for decadent pumpkin cake with chocolate chips and pecans. Super moist and perfect for fall entertaining! It was Thanksgiving in Canada this past weekend, which meant most of my free time was spent preparing to host dinner for our extended family members who live nearby. Needless to say, I didn’t get as much accomplished on my office makeover as I would’ve liked, so I’m pushing that update a little later in the week. Instead, I thought I’d share a recipe for a decadent pumpkin cake that’s super moist and perfect for fall entertaining. In a medium bowl, whisk together flour, cinnamon, pumpkin pie spice, baking soda, and salt. Set aside. In the bowl of a stand mixer or in a large bowl using a handheld electric mixer, cream the butter, applesauce, granulated sugar and brown sugar on medium-high speed until smooth. Beat in egg and vanilla until combined. Add pumpkin puree and mix until combined. Mix in the dry ingredients a bit at a time, stirring just until combined. Fold in the chocolate chips and pecans. Spread the batter evenly in the prepared pan. Bake until the edges begin to pull away from the sides of the pan a bit and a toothpick inserted in the center comes out with just a few moist crumbs attached, around 35 to 40 minutes (do not over bake). Allow the cake to cool a bit and serve warm (with a scoop of vanilla ice cream to up the yummy factor or an ice cold glass of milk!). 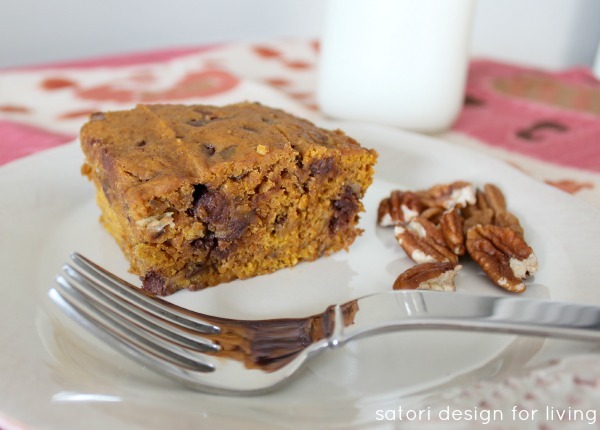 A super moist pumpkin cake that's perfect for fall entertaining. Oh, Shauna! This looks beautiful! I am definitely going to pin this. I love all things pumpkin! Thanks Tara. Just be careful not to be home alone with a pan. You could be in trouble- just saying! Happy belated to you as well. Those roasted veges sound yummy (I can never get enough veges)! I also tried a new stuffing recipe out of November’s issue of Style at Home and it was good, but needs to be tweaked a bit for our liking. Thanks for stopping by! I am a pumpkin-aholic! This looks so good. Hmmm looks good Shauna! I do love pecans and pie too – Pinned!! Believe it or not, I have never baked with pumpkin! Time to change that up, I think – delicious looking recipe! That’s crazy! It keeps everything super moist and delicious, including this cake. You must give pumpkin a try! Ok, minus the nuts (deathly allergy) this is an awesome recipe. Pinned it! Can’t wait to wow my next family dinner!